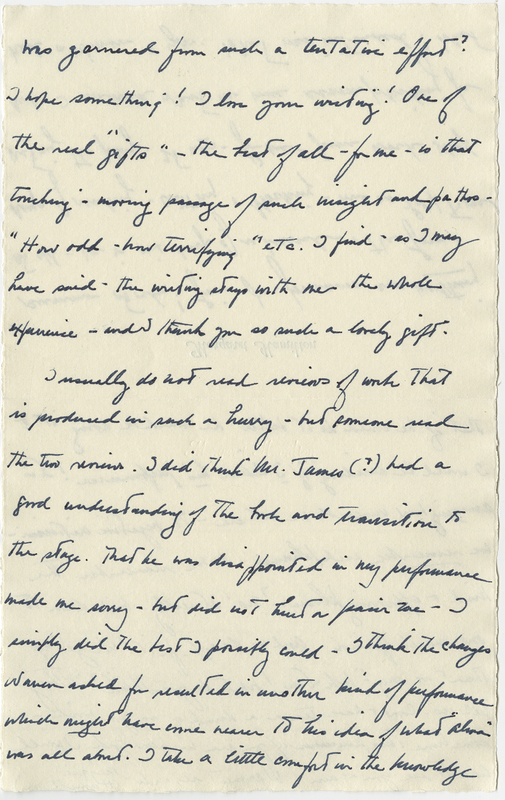 Taylor has worked at the Ransom Center as a rare book cataloger and, presently, as a manuscripts archivist. 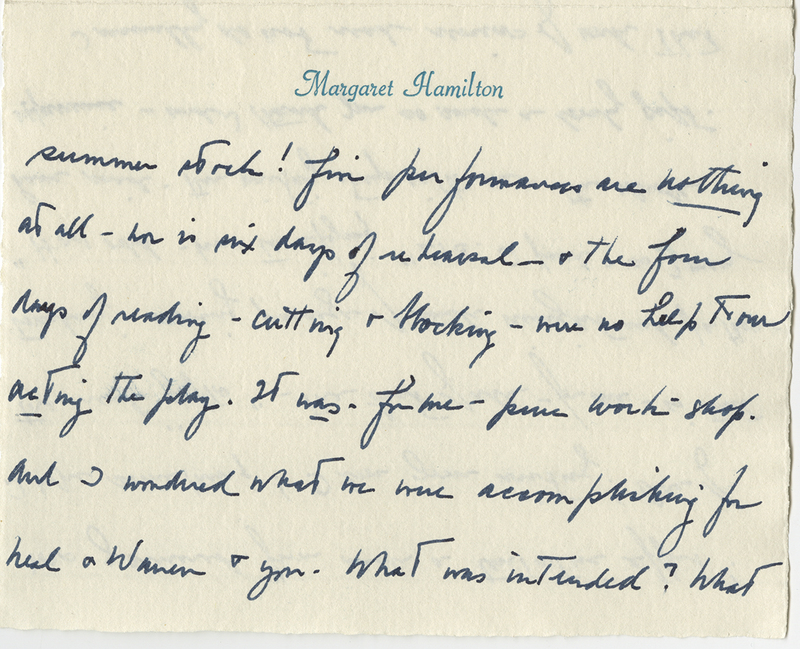 He has processed the papers of Peter Glenville, James Jones, and Lillian Hellman, among others. 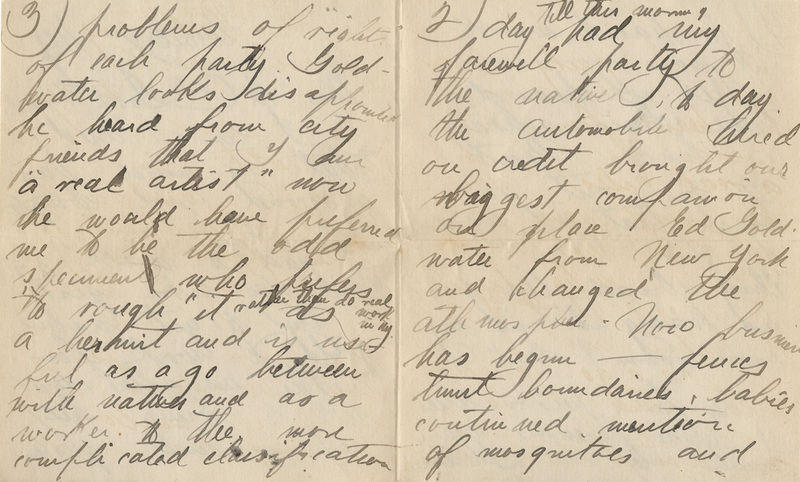 Among the papers of Mary Mowbray Clarke included in the Sunwise Turn archive is Ms. Mowbray Clarke’s personal correspondence. 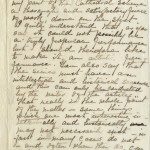 The major portion of these letters span the years 1905–1917, from about the time she married John Mowbray Clarke up to the opening of the Sunwise Turn bookshop in partnership with Madge Jenison. 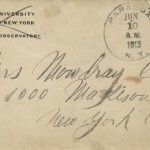 A large portion of this correspondence was with her friends in the artistic and cultural community of New York in those early years of the twentieth century. A good number of these correspondents were public figures whose names are still recognized—Vachel Lindsay, Jerome Myers, Ezra Pound, Beatrice Wood—but others are essentially forgotten. 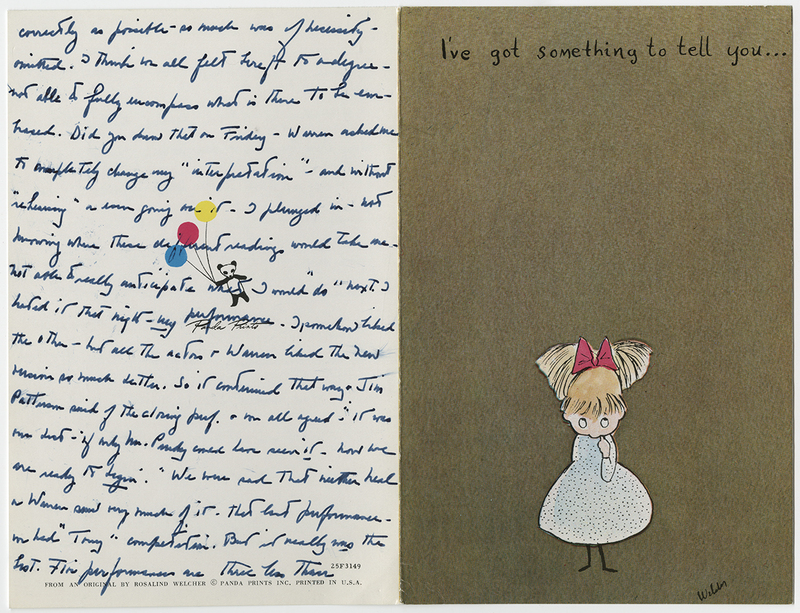 One such person was the artist Howard Kretz Coluzzi. 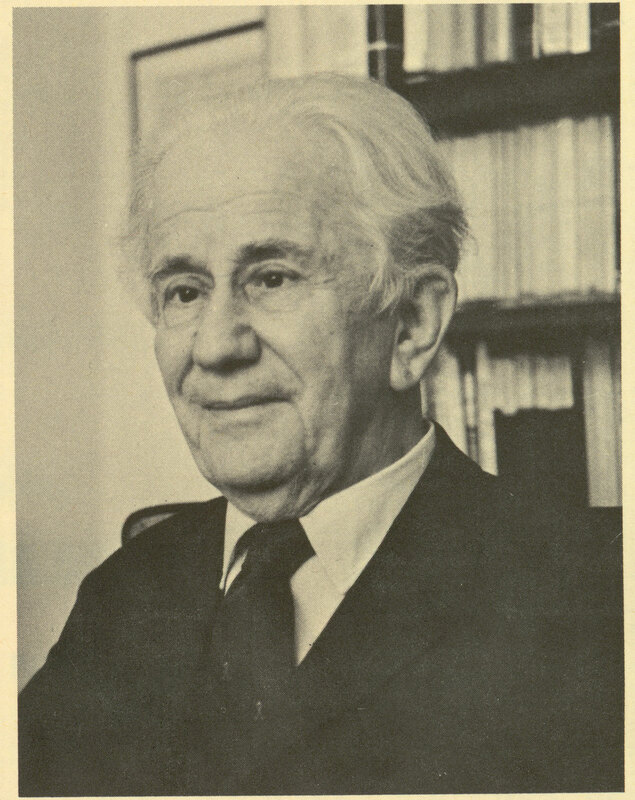 Kretz Coluzzi was born in New York in 1876 or 1877 to Dr. F. Henry and Thekla Kretz. He was brought up in a cultured household in comfortable circumstances and first came to public attention in May 1899 when he jumped off the Brooklyn Bridge into the East River. Fished from the water by the crew of a passing boat, the 22- year-old National Academy of Design student told the magistrate at his hearing the following day that he couldn’t explain his jump but that he “felt sure I would not be injured and that I would come out all right.” He added that he’d previously made high jumps into Schroon Lake in the Adirondacks that had seemed more dangerous to him than this leap. While Kretz Coluzzi continued to display eccentricities, along with, apparently, considerable artistic ability and a fair measure of ordinary human sociability, he never again attempted a feat of such bravado. 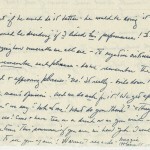 Howard Kretz’s acquaintance with Mary Mowbray Clarke was probably a result of her husband’s role in presenting the 1913 Armory Show, at which Kretz Coluzzi exhibited. With the Mowbray Clarkes and Madge Jenison hard at work readying their shop for its late 1915 opening, Kretz Coluzzi pitched in with freely offered decorating ideas and practical woodworking skills. The Sunwise Turn quickly became a springboard for another creative venture for the artist: the Lewisohn sisters’ Neighborhood Playhouse. 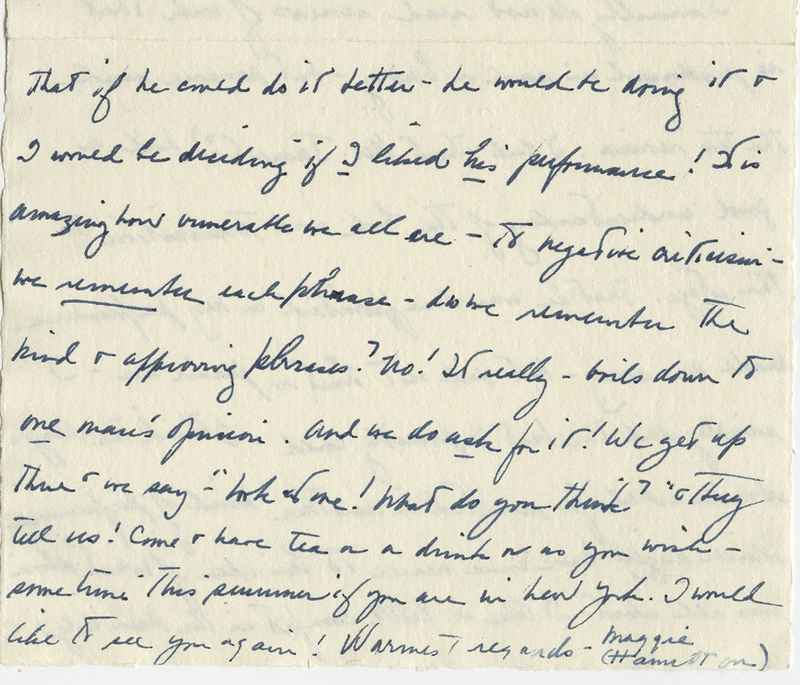 Alice and Irene Lewisohn had been pupils, and eventually good friends, of Mary Mowbray Clarke, so Howard Kretz’s artistic association with the playhouse was, if not inevitable, at least not surprising. Kretz Coluzzi produced ideas for set designs for several productions at the playhouse between 1915 and 1919. At some point in the 1920s Kretz Coluzzi forsook New York, where he’d spent years commuting between Manhattan, with its cultural excitement, and the Adirondacks’ green solitude, for northern New Mexico. In Santa Fe he spent his last years drawing and painting, teaching (at least some of the time at the Santa Fe Art School), and engaging in various hijinks. He died on March 27, 1942 from an infected cat scratch. 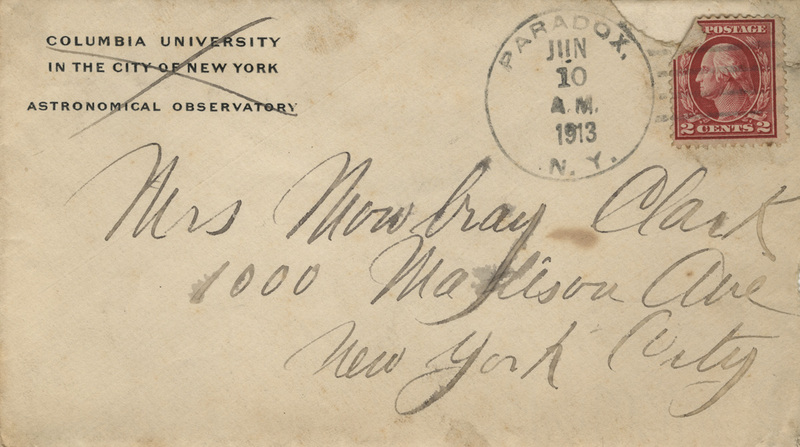 The Columbia University return address on the envelope is probably accounted for by the fact that Howard’s younger brother Walter attended Columbia and did graduate work in astronomy before becoming a practicing mechanical engineer. 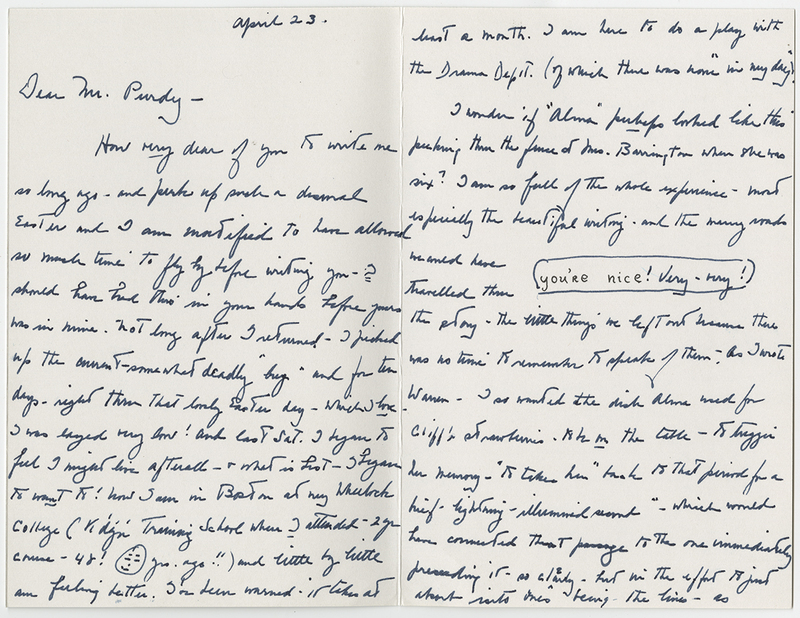 Howard perhaps found a cache of his brother’s old envelopes and made appropriate use of them. 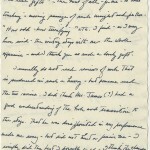 Letter by Howard Kretz dated June 10, 1913 from the Sunwise Turn Bookshop Collection. 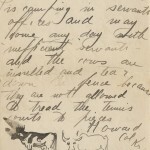 Final page of letter of June 10, 1913, in which Howard Kretz mentions his fear that the resort camp’s cows will be “insulted [by his mother’s new fence] and tear down the fence because they are not allowed to tread the tennis courts to pieces.” He closes with his signature and a sketch of two presumably insulted cows. 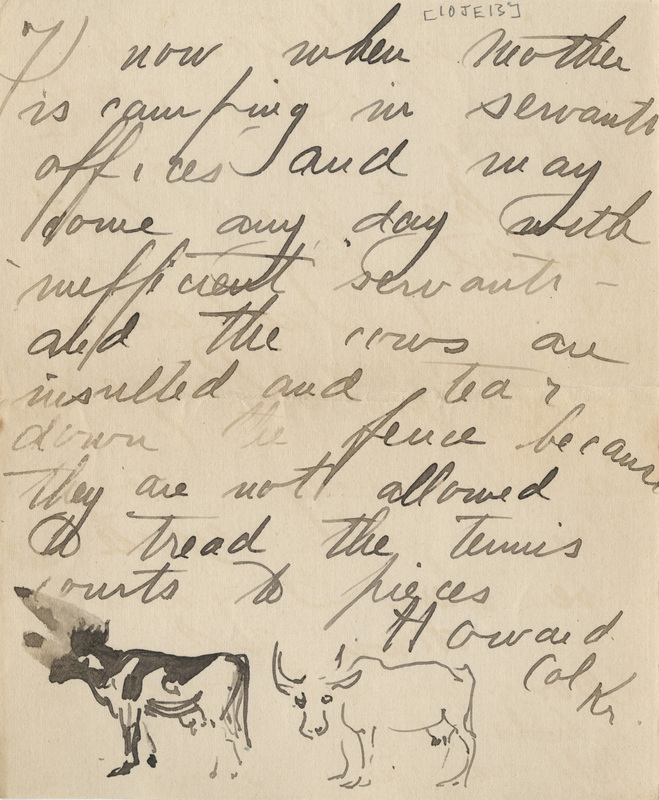 The letters in this 1913–1916 group are all signed “Howard Col Kr” or “Howard C K,” so his practice of identifying himself as Howard Kretz Coluzzi was evidently still in the future. 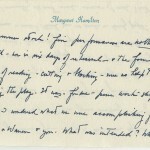 Biographer Judith Major’s recent book Mariana Griswold Van Rensselaer: A Landscape Critic in the Gilded Age (University of Virginia Press) highlights the work of the pioneering landscape critic, and Major quotes from one of the letters in the Ransom Center’s Elizabeth and Joseph Pennell papers for her book. Joseph Pennell (1857–1926) was one of America’s premier etchers and illustrators. He found a commercial success as a magazine illustrator, turning out well-received renderings of American and, later, European scenes. 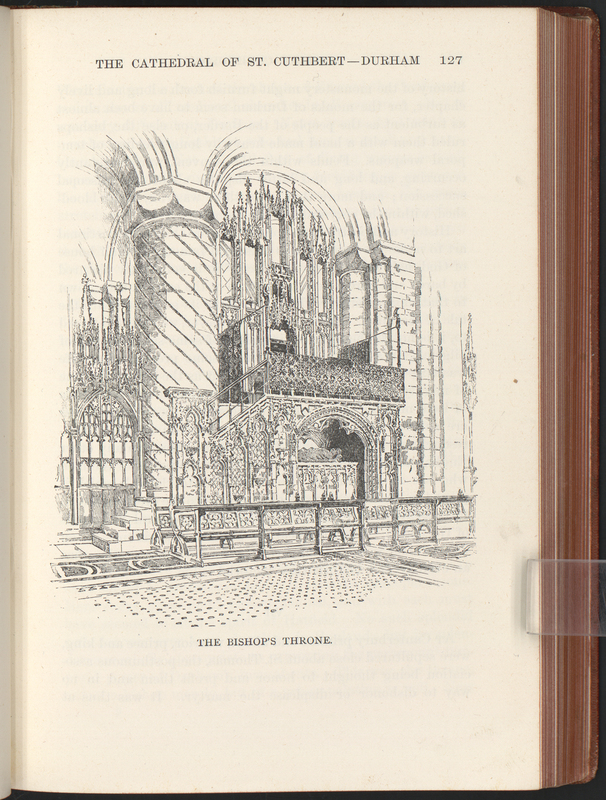 The Pennell collection includes correspondence that documents a notable creative project undertaken by Joseph Pennell (1857–1926) and Mariana Van Rensselaer (1851–1934) in which they published illustrated articles on the cathedrals and churches of England and France. 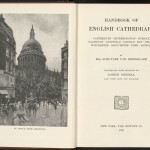 Their two series of illustrated articles appeared in issues of The Century Magazine between 1887 and 1899; the first series, English Cathedrals, was issued in book form in 1892. 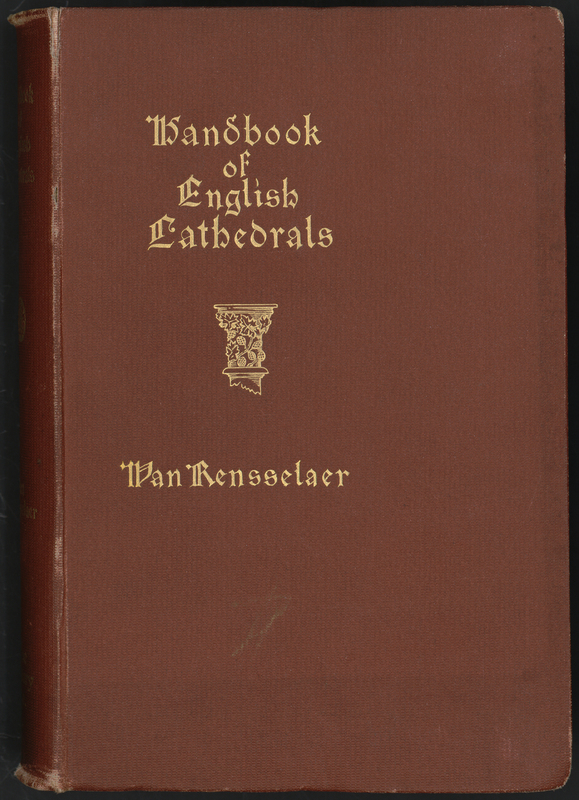 In 1882, when the idea for the articles on the cathedrals of England was first conceived by Van Rensselaer, she had been a published author and critic on art, architecture, and landscape architecture for six years. 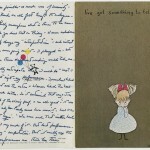 Pennell had been working as an illustrator, first in his native Philadelphia and then nationally, since the late 1870s. He had done illustrations in Scribner’s Magazine, Century, and other publications. His best-known work at that point was the illustrations he executed to accompany George Washington Cable’s text for The Creoles of Louisiana, issued serially in The Century Magazine during 1883 and published in book form in 1884. 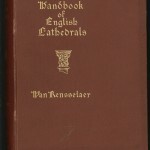 Van Rensselaer likely invited Joseph Pennell to provide the illustrations for her English cathedral articles because both Van Rensselaer and the Century’s editor, Richard Watson Gilder, knew and respected Pennell’s work. In 1884, Pennell was living in London, married to Elizabeth Robins, a writer and fellow Philadelphian. 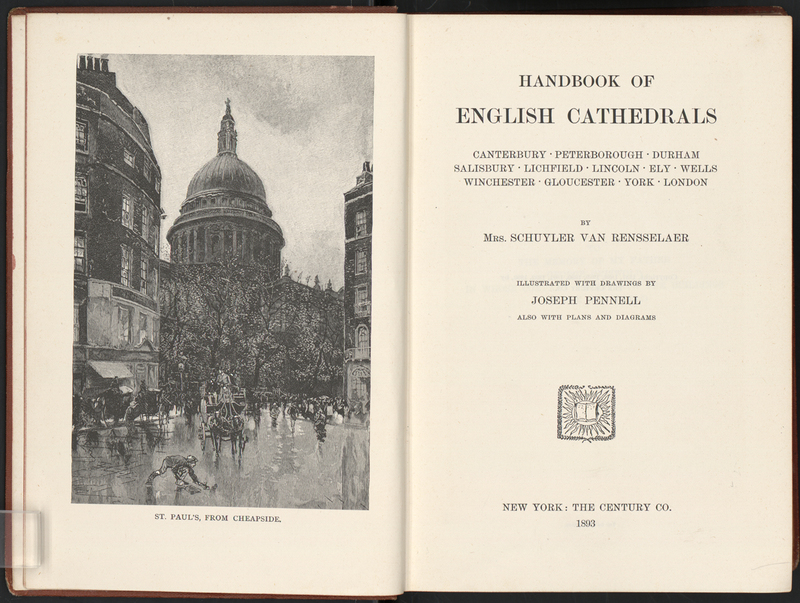 The work on the English cathedrals got off to a rocky start when, in the summer of 1885, Van Rensselaer, returning to New York from Germany, stopped in York, England, expecting to meet with Pennell. 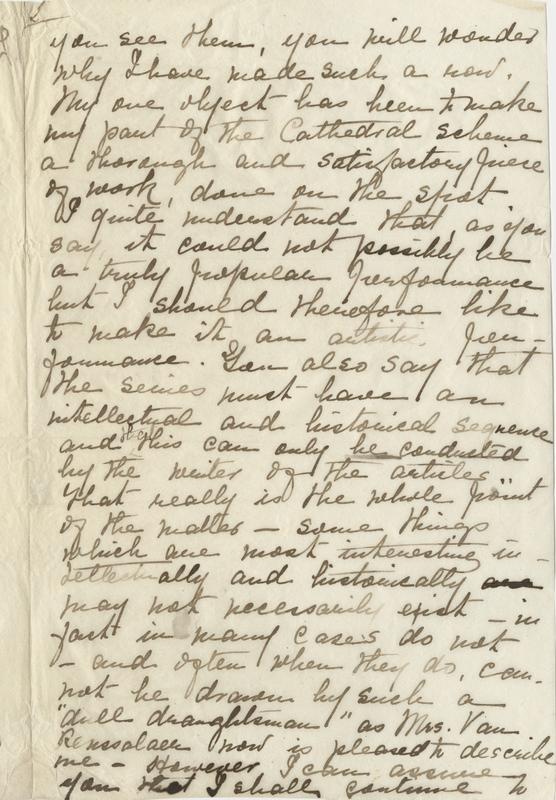 Pennell didn’t appear or account for his absence, and when later they were able to meet, he related to his wife, Elizabeth, “his frank impressions of Mrs. Van Rensselaer, who had ideas for the cathedral [at Salisbury] which were not his.” Despite this initial awkwardness the English cathedral series was completed “without unpleasantness” (in Elizabeth Pennell’s words), and the final article published in The Century Magazine by 1889. As Pennell began his work on the churches of France in the fall of 1889, a new source of discord between artist and writer made itself evident. Pennell had begun working with churches in the south of France when he discovered several of those chosen for illustration had undergone recent restoration or were currently under restoration. 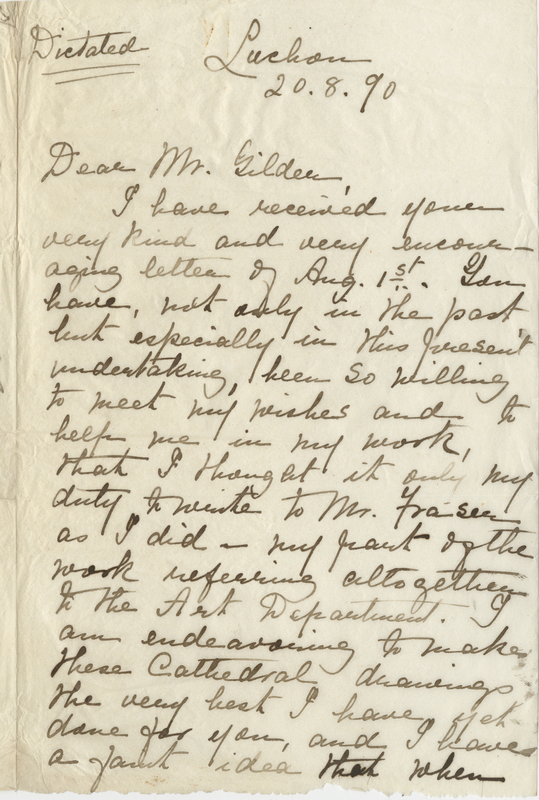 This situation and the artist’s response to it had a significant impact upon his choices of subjects and the drawings he sent back to New York. 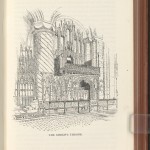 In a long letter Van Rensselaer wrote to W. Lewis Fraser of the Century art department on January 30, 1890, she reviewed Pennell’s drawings, and while on the whole she was pleased, she found problems with the cathedrals in Angoulême and Périgueux and the St. Sernin church in Toulouse. Mariana Van Rensselaer withdrew from the project before the fourth article in the French cathedral series appeared in the September 1899 issue of The Century Magazine. 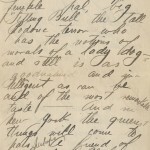 Since Pennell had finished drawings on hand, the editors of the magazine asked Elizabeth Pennell to write the articles, allowing the series to be completed between 1907 and 1909. The cathedrals of Amiens, Beauvais, and Rouen concluded the project; these three were the only edifices in the series that Joseph Pennell etched on site. 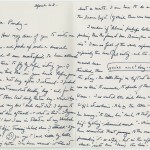 Within the Ransom Center’s extensive collection of papers of British author and poet Edmund Blunden (1896–1974) is a group of printed maps. 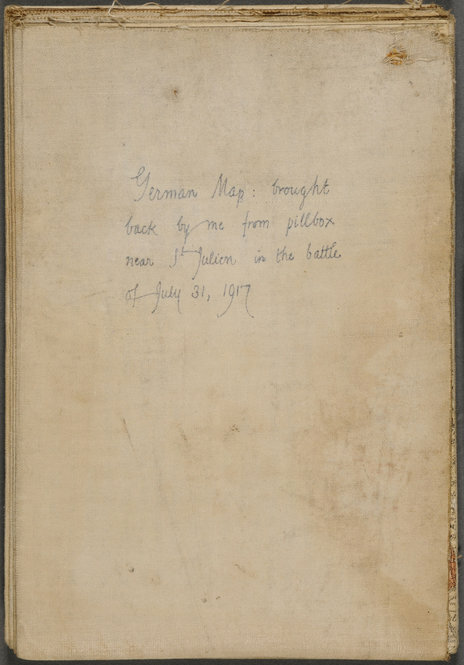 These maps came into Blunden’s possession during his service as an officer in the Royal Sussex Regiment during World War I. 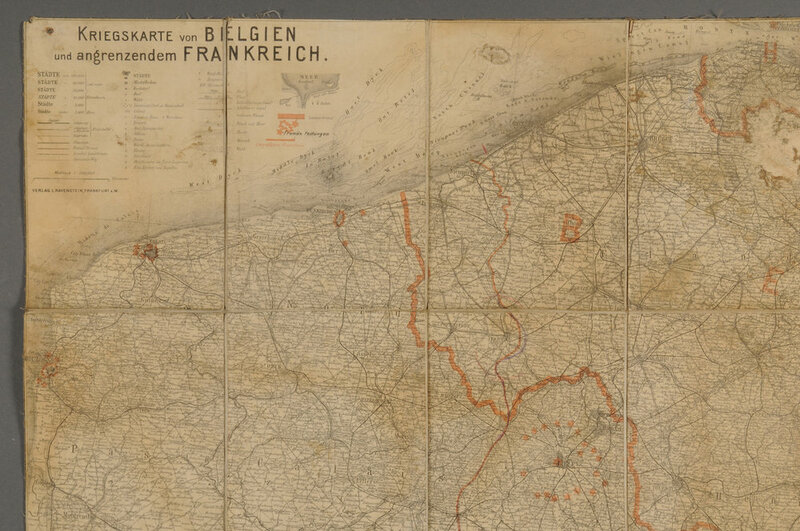 Most of the maps are British Ordnance Survey trench maps detailing various sectors in southwestern Belgium in the vicinity of Ypres and are what one might expect to find among the papers of an officer veteran of a conflict. One, however, differs in that it was acquired by then Lt. Blunden in the village of St. Julien under unusual circumstances. That day was the first of the campaign known as Third Ypres or, by a name having special resonance, as Passchendaele. The village of St. Julien is about four miles northeast of Ypres on the road to Langemarck and Poelkapelle and was one of the first objectives taken by British troops in a campaign intended to build upon the success of the earlier battle of Messines Ridge, fought the previous June to the immediate south of Ypres. As is so often the case in war, the early expectations of success eluded the planners of the offensive. Field Marshal Douglas Haig’s belief the that German army was near collapse proved illusory, and the hope of achieving a decisive breakthrough faded as the campaign wore on. Eventually the capture of the village of Passchendaele, seven miles east of Ypres, and a low ridge just beyond was settled on as a realistic culmination. When Canadian troops took the heights on November 9, 1917, the campaign came to an end, and an Allied victory was declared. 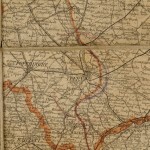 The map Blunden saved from the German bunker is a commercially published map in a scale of 1:300,000, issued by the firm of L. Ravenstein of Frankfurt am Main. 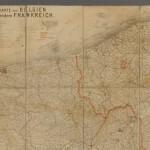 Despite its title of Kriegskarte von Belgien und angrenzendem Frankreich (War Map of Belgium and Bordering Areas of France), it appears to be an undated wartime reissue of a conventional prewar political map. It has been updated by overprinting in red indicating “fremde Festungen” (foreign fortresses) and “ungefähre Frontlinie” (approximate frontlines). The Blunden copy has further been cut into panels and mounted on cloth backing. It has one correction to the “front lines” done in graphite pencil, and, oddly for a map apparently in use in late July 1917, the area from Messines to Wytschaete taken by British forces in the struggle for Messines Ridge nearly two months earlier still appears on the map as a German salient. 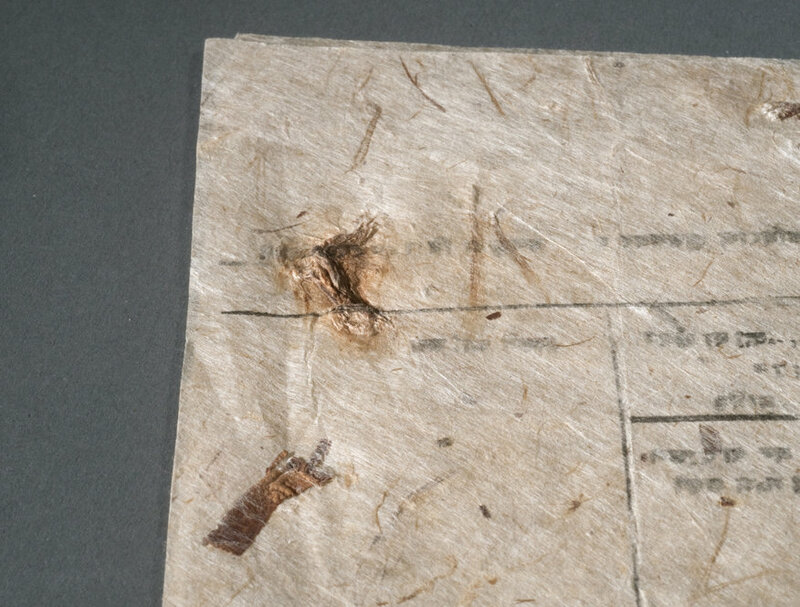 Identification of map in hand of Edmund Blunden on cloth backing of folded map. 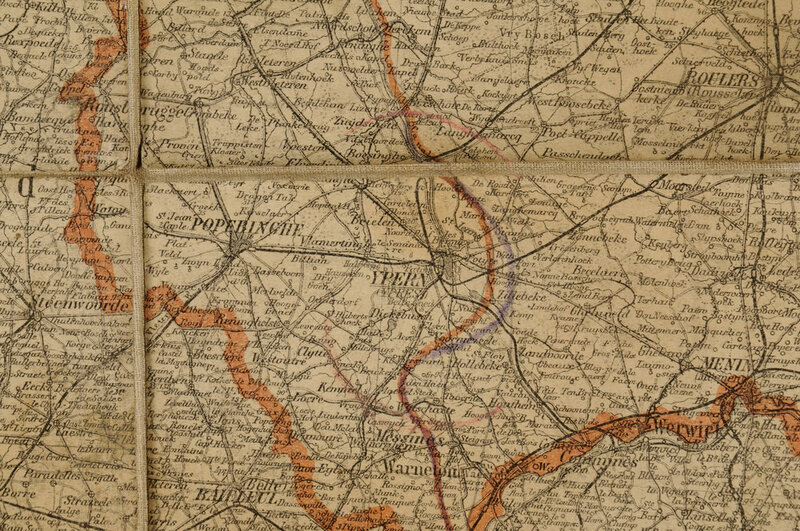 Dark spot in upper right hand corner indicates place where a tack once held map on wall for display. Upper left hand corner of the 32 in. by 43 in. map. Broad red line indicates the border between Belgium (upper right) and France (lower left). The thin red line running vertically near the center is the line of trenches separating the German forces on the right hand from the British and French at the left. 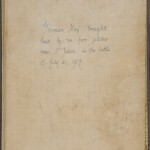 Closeup of area where Blunden recovered the map on July 31, 1917. St. Julien is northeast of Ypres (“Ypern” in German) at the upper edge of the panel; Passchendaele is just above St. Julien on the next panel. To the left of Passchendaele is seen “Langhemarcq” (Langemarck). The area shown in this detail was, along with Verdun in France, the most violently fought over terrain in the whole of the Great War. 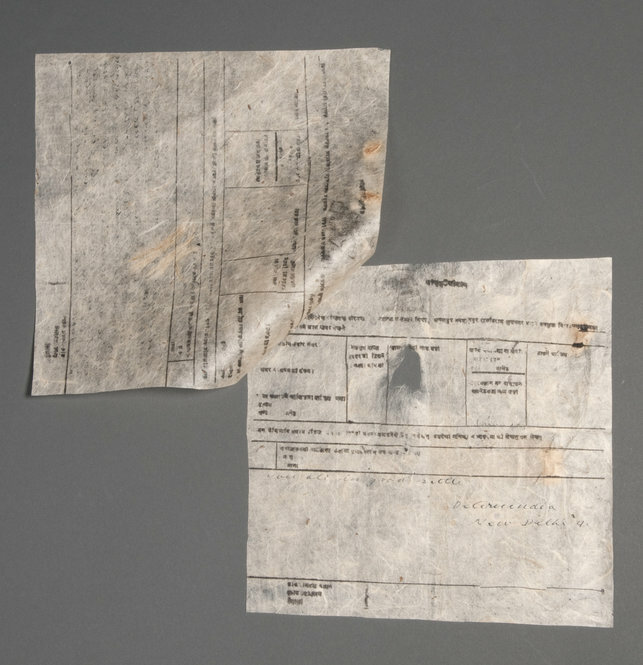 A recent project to reorganize some materials in the papers of British author Compton Mackenzie (1883–1972) brought to light specimens of traditional Nepalese handmade paper serving in a most prosaic capacity. 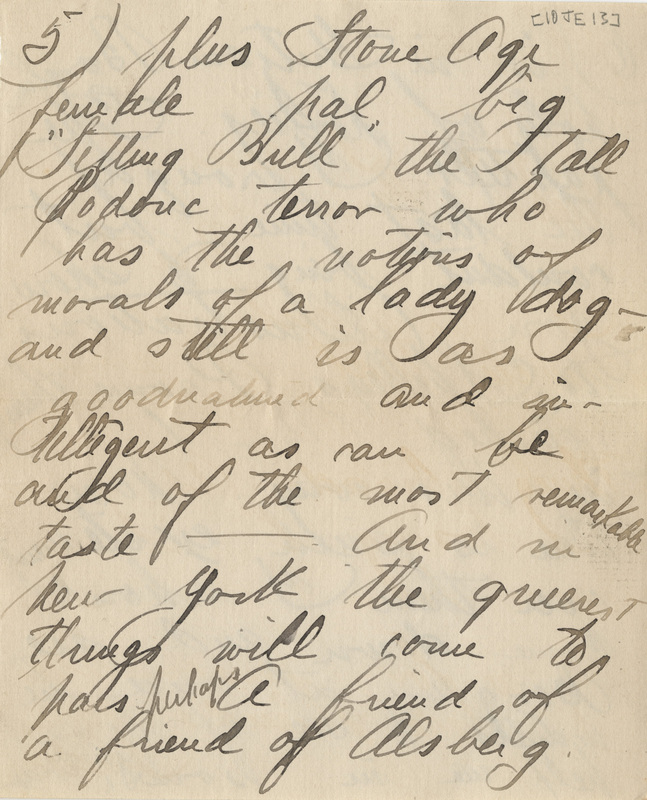 During the late 1920s and early 1930s, Mackenzie travelled widely and at one point was contacted while in the remote Himalayan kingdom of Nepal by a London publisher. 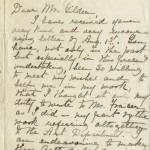 The message from London arrived via New Delhi, India, in the form of a telegram and asked if Mackenzie would consider a “biography of Churchill” upon completion of his present commitment. Unless the biography sought was to be a brief piece for a newspaper or periodical, it would appear it was never written by Mackenzie. 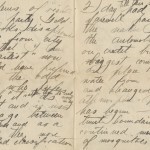 So, in a sense, the telegram was just one more of those numberless pieces of paper that the active life of a published author produces, and a creative dead end at that. 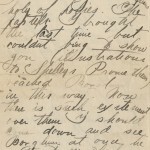 But this telegram was very different from most others in that it was written out on paper unlike any I have ever seen. 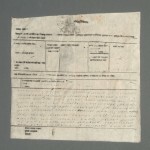 The form was printed in Devanagari script on two sheets and was accompanied by three more unused blanks. 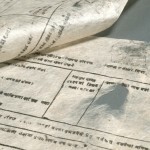 The paper is called lokta and is prepared by hand from fibers obtained from the bark of the Nepalese lokta tree (Daphne cannabina). While lokta paper manufacture requires much the same general techniques as traditional Western handmade paper, the present specimens exhibit a faint but uniform criss-cross design when held up to the light rather than the distinct chain-and-wire lines of their Western equivalents. The finished product is said to be durable and resistant to insect damage. 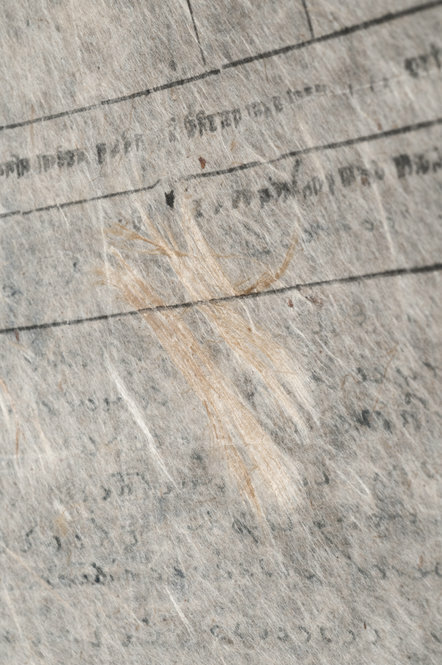 The sheets in the Mackenzie papers are remarkable for their texture and appearance, exhibiting bits of bark and small twigs worked into the fabric of the paper, dramatic whorls of lokta fiber here and there, and even occasional voids in the paper’s surface. 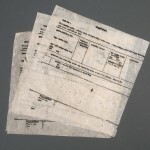 The paper is a mottled pale tan in color and more nearly translucent than opaque. 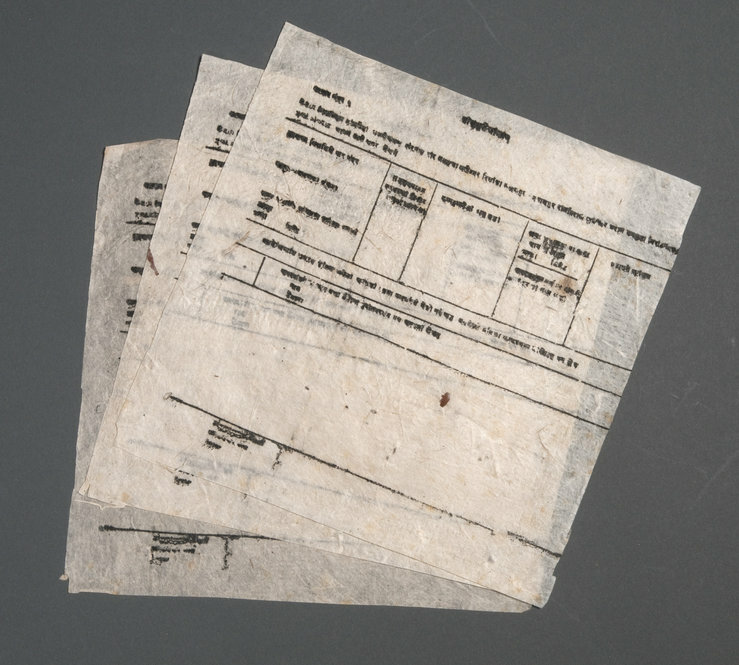 It seems to have been lightly treated during manufacture with sizing, so has a feel more like cloth than traditional paper. The effect is at once one of extreme primitiveness of technique, and yet, at the same time, one of remarkable beauty. 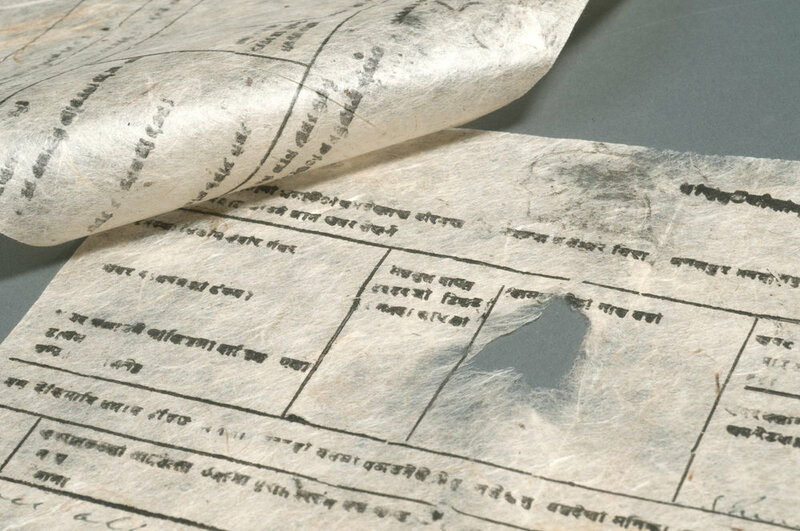 A web search provided several brief histories of lokta paper, which indicate that it was employed by the Nepalese government until the 1950s for its official correspondence and that it continues to find a role there in the preparation of certain classes of documents. Use of the paper is on the decline in Nepal as it is being displaced by conventional machine-made papers, but there is a substantial international market for it among those attracted by its remarkable texture and appearance. 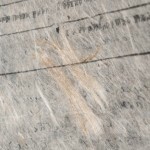 English hand on two sheets of a paper known as lokta, which is prepared by hand from fibers obtained from the bark of the Nepalese lokta tree (Daphne cannabina). 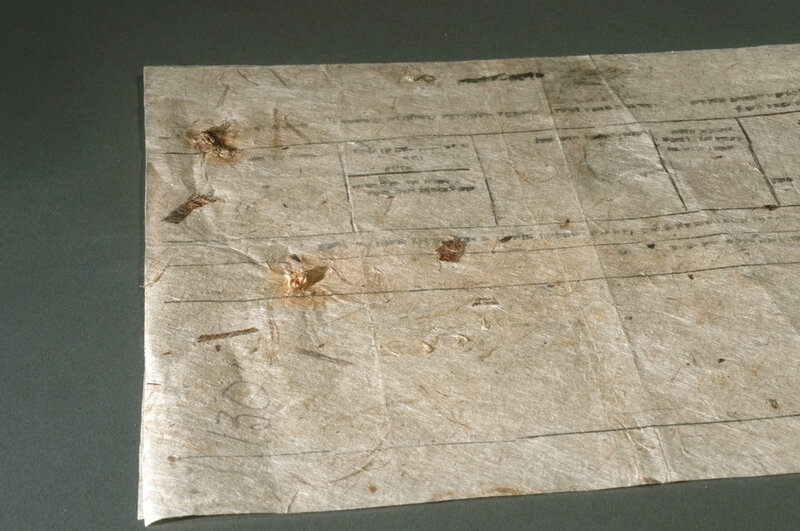 This telegram to Compton Mackenzie was written out in an English hand on two sheets of a paper known as lokta, which is prepared by hand from fibers obtained from the bark of the Nepalese lokta tree (Daphne cannabina). 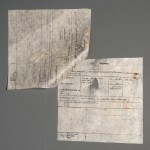 This image shows the second page of the telegram with a void, or defect, in the paper. 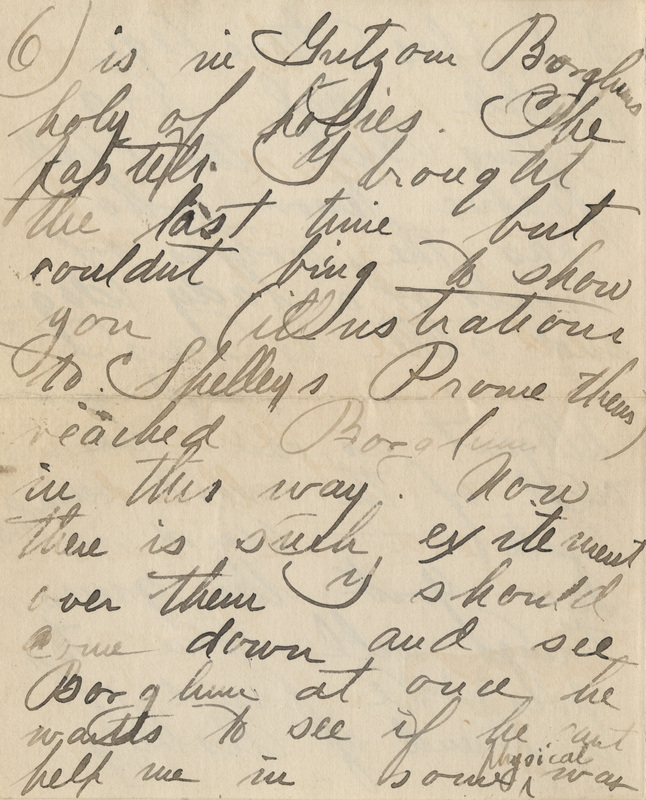 The sheets in the Mackenzie papers are remarkable for their texture and appearance and exhibit occasional voids in the paper’s surface. 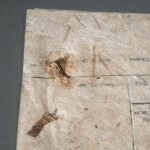 The sheets show bits of bark and small twigs worked into the fabric of the paper, and dramatic whorls of lokta fiber here and there. 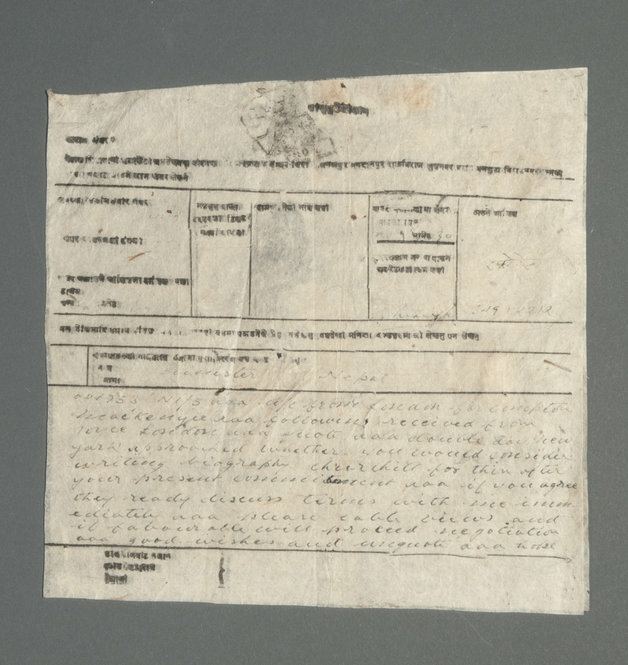 The paper on which the form (in Devanagari script) was printed was accompanied by three more unused blanks. 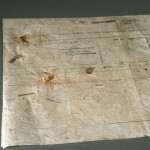 The lokta paper shows bits of bark and small twigs integrated into the fabric of the paper.